City, University of London took part in the Lord Mayor of London’s recent visit to Tokyo which was intended to develop closer links between London and Tokyo, particularly in finance and business. 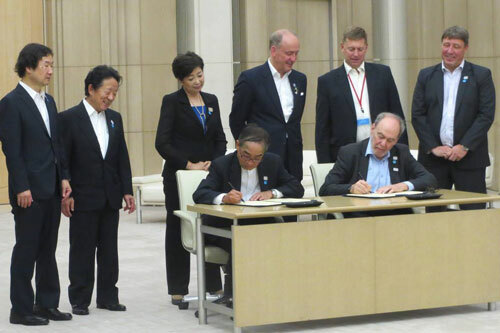 As part of the visit, City signed a Memorandum of Understanding (MoU) with Tokyo Metropolitan University (TMU) at the offices of the Tokyo Metropolitan Government. Founded in 2005, TMU’s mission is ’to pursue the vision of an ideal human society in a metropolis.’ TMU is supported by the Tokyo Metropolitan Government and as a leading public university, focuses on cutting-edge interdisciplinary research on urban issues. In the Times Higher Education World University Rankings 2016-2017, TMU was ranked 9th (tie) among Japanese universities. Composed of seven faculties, 23 departments and seven graduate schools, TMU has approximately 7,000 undergraduates, 2,000 graduate students, and 1,000 faculty members across three campuses, making it 10,000 strong in its entirety. The initial work with City will focus on collaboration between Cass Business School and TMU. Professor Jun Ueno, President, TMU and Professor Stanton Newman, Vice President, International, City, signing the MoU with Professors Takashi Ohhashi, TMU; Dr Haruo Shimada, TMU; Ms Yuriko Koike; Governor of Tokyo; Alderman Charles Bowman, Lord Mayor of London; His Excellency Mr Paul Madden; British Ambassador to Japan and Dr Dirk Nitzsche, Cass Business School.